(Phys.org) —As robotics has become an increasingly popular way to get kids and teens involved in the field of engineering, the robotics projects that the kids are doing have become more creative and sophisticated. A new online exhibit hosted by EXPO21XX, called Junior Robotics, has recently launched and begun showcasing the variety of robotics projects happening in the K-12 scene. "Robotics has attracted great interest in primary and high schools and summer workshops because it lays the first foundation in preparing the way for high school robotics enthusiasts to achieve at the university level," Seth Quartey, the Universities' Projects Specialist at EXPO21XX, Hannover, Germany, told Phys.org. "Having previously set up the Universities Robotics platform, an online repository for university robotics laboratories to display their projects' videos, pictures and texts, I thought it was now time to add a new platform called Junior Robotics, for young and budding robotics enthusiasts in high schools that shows their electronics and robotics projects, competitions and engineering vision to the world." The Junior Robotics platform features high schools, corporations, institutions, and youth groups that in one way or another support robotics programs for kids and teens. Some of the featured robotics projects include the German robot soccer champion T'N'T Robotik; robots constructed by students at Mililani High School that play a game resembling basketball; a programmable robot by iRobot called Create and information on iRobot's SPARK program; information on the US National Robotics Week and the US Congressional Robotics Congress; and robots at RoboGames that do cartwheels, shoot flames, and engage in sumo wrestling and kung fu, among many others. By providing a single place where educators and students can view many different robotics projects, the Junior Robotics exhibit aims to inspire and connect those who are interested in becoming involved. 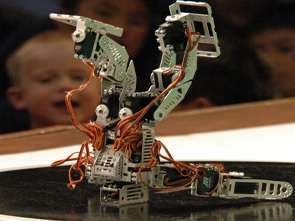 There is no fee required to display on the Junior Robotics platform, and youth robotics programs are encouraged to submit information on their work if they are interested in having an exhibit. "It is easy to display on the platform," Quartey said. "EXPO21XX designs and makes updates to the platform. With the link to their websites in hand, they download their best photos and videos to design the stand. They receive a link for review within four weeks and only publish when they are fully satisfied." All those interested in displaying on the Junior Robotics platform can send an email to Dr. Seth Quartey to make arrangements on how to proceed.